A drop on a lotus surface, with a contact angle of greater than 146°. 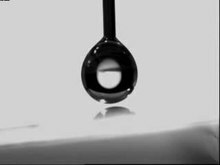 A water droplet falling onto a superhydrophobic, elastic surface. Ultrahydrophobic (or superhydrophobic) surfaces are highly hydrophobic, i.e., extremely difficult to wet. The contact angles of a water droplet on an ultrahydrophobic material exceed 150°. This is also referred to as the lotus effect, after the superhydrophobic leaves of the lotus plant. A droplet striking these kinds of surfaces can fully rebound like an elastic ball, or pancake. In 1805, Thomas Young defined the contact angle θ by analysing the forces acting on a fluid droplet resting on a solid surface surrounded by a gas. A liquid droplet rests on a solid surface and is surrounded by gas. The contact angle, θC, is the angle formed by a liquid at the three phase boundary where the liquid, gas, and solid intersect. A droplet resting on a solid surface and surrounded by a gas forms a characteristic contact angle θ. If the solid surface is rough, and the liquid is in intimate contact with the solid asperities, the droplet is in the Wenzel state. If the liquid rests on the tops of the asperities, it is in the Cassie-Baxter state. where r is the ratio of the actual area to the projected area. Wenzel's equation shows that microstructuring a surface amplifies the natural tendency of the surface. A hydrophobic surface (one that has an original contact angle greater than 90°) becomes more hydrophobic when microstructured – its new contact angle becomes greater than the original. However, a hydrophilic surface (one that has an original contact angle less than 90°) becomes more hydrophilic when microstructured – its new contact angle becomes less than the original. where φ is the area fraction of the solid that touches the liquid. Liquid in the Cassie-Baxter state is more mobile than in the Wenzel state. It can be predicted whether the Wenzel or Cassie-Baxter state should exist by calculating the new contact angle with both equations. By a minimization of free energy argument, the relation that predicted the smaller new contact angle is the state most likely to exist. Stated mathematically, for the Cassie-Baxter state to exist, the following inequality must be true. A recent alternative criteria for the Cassie-Baxter state asserts that the Cassie-Baxter state exists when the following 2 criteria are met: 1) Contact line forces overcome body forces of unsupported droplet weight and 2) The microstructures are tall enough to prevent the liquid that bridges microstructures from touching the base of the microstructures. Contact angle is a measure of static hydrophobicity, and contact angle hysteresis and slide angle are dynamic measures. Contact angle hysteresis is a phenomenon that characterizes surface heterogeneity. When a pipette injects a liquid onto a solid, the liquid will form some contact angle. As the pipette injects more liquid, the droplet will increase in volume, the contact angle will increase, but its three phase boundary will remain stationary until it suddenly advances outward. The contact angle the droplet had immediately before advancing outward is termed the advancing contact angle. The receding contact angle is now measured by pumping the liquid back out of the droplet. The droplet will decrease in volume, the contact angle will decrease, but its three phase boundary will remain stationary until it suddenly recedes inward. The contact angle the droplet had immediately before receding inward is termed the receding contact angle. The difference between advancing and receding contact angles is termed contact angle hysteresis and can be used to characterize surface heterogeneity, roughness, and mobility. Surfaces that are not homogeneous will have domains which impede motion of the contact line. The slide angle is another dynamic measure of hydrophobicity and is measured by depositing a droplet on a surface and tilting the surface until the droplet begins to slide. Liquids in the Cassie-Baxter state generally exhibit lower slide angles and contact angle hysteresis than those in the Wenzel state. A simple model can be used to predict the effectiveness of a manmade micro- or nano-fabricated surface for its conditional state (wenzel or cassie-baxter), contact angle and contact angle hysteresis. The main factor of this model is the contact line density, Λ, which is the total perimeter of asperities over a given unit area. The critical contact line density Λc is a function of body and surface forces, as well as the projected area of the droplet. If Λ > Λc, drops are suspended in the cassie-baxter state. Otherwise, the droplet will collapse into the wenzel state. To calculate updated advancing and receding contact angles in the cassie-baxter state, the following equations can be used. M. Nosonovsky and B. Bhushan studied the effect of unitary (non-hierarchical) structures of micro and nano roughness, and hierarchical structures (micro roughness covered with nano roughness). They found that hierarchical structure was not only necessary for a high contact angle but essential for the stability of the water-solid and water-air interfaces (the composite interface). Due to an external perturbation, a standing capillary wave can form at the liquid–air interface. If the amplitude of the capillary wave is greater than the height of the asperity, the liquid can touch the valley between the asperities; and if the angle under which the liquid comes in contact with the solid is greater than h0, it is energetically profitable for the liquid to fill the valley. The effect of capillary waves is more pronounced for small asperities with heights comparable to the wave amplitude. An example of this is seen in the case of unitary roughness, where the amplitude of asperity is very low. This is why the likelihood of instability of a unitary interface will be very high. Many very hydrophobic materials found in nature rely on Cassie's law and are biphasic on the submicrometer level with one component air. The Lotus effect is based on this principle. Inspired by it, a lot of functional superhydrophobic surfaces were prepared. Water striders are insects that live on the surface film of water, and their bodies are effectively unwettable due to specialized pubescence referred to as hydrofuge; many of the body surfaces are covered with specialized "hairpiles", composed of tiny hairs spaced so closely that there are more than one thousand microhairs per mm, resulting in a hydrophobic surface. Similar hydrofuge surfaces are known in other insects, including aquatic insects that spend most of their lives submerged, with hydrophobic hairs preventing entry of water into the respiratory system. Some birds are great swimmers, due to their hydrophobic feather coating. Penguins are coated in a layer of air, and can release that trapped air to accelerate rapidly when needed to jump out of water and land on higher ground. Wearing an air coat when swimming reduces the drag, and also acts as heat insulator. Cutting a water droplet using a superhydrophobic knife on superhydrophobic surfaces. Water droplets rolling down a 5% tilted superhydrophobic surface. Dettre and Johnson discovered in 1964 that the superhydrophobic lotus effect phenomenon was related to rough hydrophobic surfaces, and they developed a theoretical model based on experiments with glass beads coated with paraffin or TFE telomer. The self-cleaning property of superhydrophobic micro-nanostructured surfaces was reported in 1977. Perfluoroalkyl, perfluoropolyether and RF plasma formed superhydrophobic materials were developed, used for electrowetting and commercialized for bio-medical applications between 1986 and 1995. Other technology and applications have emerged since the mid 1990s. A durable superhydrophobic hierarchical composition, applied in one or two steps, was disclosed in 2002 comprising nano-sized particles ≤ 100 nanometers overlaying a surface having micrometer-sized features or particles ≤ 100 µm. The larger particles were observed to protect the smaller particles from mechanical abrasion. Durable, optically transparent superhydrophobic and oleophobic coatings were developed in 2012 comprising nano particles in the 10 to 100 nm size range. Research in superhydrophobicity recently accelerated with a letter that reported man-made superhydrophobic samples produced by allowing alkylketene dimer (AKD) to solidify into a nanostructured fractal surface. Many papers have since presented fabrication methods for producing superhydrophobic surfaces including particle deposition, sol-gel techniques, plasma treatments, vapor deposition, and casting techniques. Current opportunity for research impact lies mainly in fundamental research and practical manufacturing. Debates have recently emerged concerning the applicability of the Wenzel and Cassie-Baxter models. In an experiment designed to challenge the surface energy perspective of the Wenzel and Cassie-Baxter model and promote a contact line perspective, water drops were placed on a smooth hydrophobic spot in a rough hydrophobic field, a rough hydrophobic spot in a smooth hydrophobic field, and a hydrophilic spot in a hydrophobic field. Experiments showed that the surface chemistry and geometry at the contact line affected the contact angle and contact angle hysteresis, but the surface area inside the contact line had no effect. An argument that increased jaggedness in the contact line enhances droplet mobility has also been proposed. One method to experimentally measure the jaggedness in the contact line uses low melting temperature metal melted and deposited onto micro/nano structured surfaces. When the metal cools and solidifies, it is removed from the surface. flipped, and inspected for contact line micro geometry. There have been a few efforts in fabricating a surface with tunable wettability. For the purpose of spontaneous droplet mobility, a surface can be fabricated with varying tower widths and spacings to gradually increase the free energy of the surface  The trend shows that as tower width increases, the free energy barrier becomes larger and the contact angle drops, lowering the hydrophobicity of the material. Increasing tower spacing will increase the contact angle, but also increase the free energy barrier. Droplets naturally move towards areas of weak hydrophobicity, so to make a droplet spontaneously move from one spot to the next, the ideal surface would consist of small width towers with large spacing to large width towers with small spacing. One caveat to this spontaneous motion is the resistance of stationary droplets to move. Initial droplet motion requires an external stimulus, from something as large as a vibration of the surface or as small as a simple syringe “push” as it is released from the needle. An example of readily tunable wettability is found with special developed fabrics. By stretching a dip-coated commercial fabric, contact angles were typically allowed to increase. This is largely caused by an increase in tower spacing. However, this trend does not continue towards greater hydrophobicity with higher strain. Eventually, the cassie-baxter state reaches an instability and transitions to the wenzel state, soaking the fabric. An example of a biomimetic superhydrophobic material in nanotechnology is nanopin film. In one study a vanadium pentoxide surface is presented that can switch reversibly between superhydrophobicity and superhydrophilicity under the influence of UV radiation. According to the study any surface can be modified to this effect by application of a suspension of rose-like V2O5 particles for instance with an inkjet printer. Once again hydrophobicity is induced by interlaminar air pockets (separated by 2.1 nm distances). The UV effect is also explained. UV light creates electron-hole pairs, with the holes reacting with lattice oxygen creating surface oxygen vacancies while the electrons reduce V5+ to V3+. The oxygen vacancies are met by water and this water absorbency by the vanadium surface makes it hydrophilic. By extended storage in the dark, water is replaced by oxygen and hydrophilicity is once again lost. Another example of a biomimetic surface includes micro-flowers on common polymer polycarbonates. The micro/nano binary structures (MNBS) imitate the typical micro/nanostructure of a lotus leaf. These micro-flowers offer nanoscale features which enhance the surface's hydrophobicity, without the use of low surface energy coatings. Creation of the superhydrophobic surface through vapor-induced phase separation at varying surrounding relative humidities caused a likewise change to the contact angle of the surface. Surfaces prepared offer contact angles higher than 160° with typical sliding angles around 10°. Low surface energy coatings can also provide a superhydrophobic surface. A self-assembled monolayer (SAM) coating can provide such surfaces. To maintain a hydrophobic surface, the head groups bind closely to the surface, while the hydrophobic micelles stretch far away from the surface. By varying the amount of SAM you coat on a substrate, one could vary the degree of hydrophobicity. Particular superhydrophobic SAMs have a hydrophobic head group binding to the substrate. In one such work, 1-dodecanethiol (DT; CH3(CH2)11SH) is assembled on a Pt/ZnO/SiO2 composite substrate, producing contact angles of 170.3°. The monolayers could also be removed with a UV source, decreasing the hydrophobicity. Superhydrophobic surfaces are able to stabilize the Leidenfrost effect by making the vapour layer stable. Once the vapour layer is established, cooling never collapses the layer, and no nucleate boiling occurs; the layer instead slowly relaxes until the surface is cooled. Fabricating superhydrophobic polymer surfaces with controlled geometry can be expensive and time consuming, but a small number of commercial sources provide specimens for research labs. Active recent research on superhydrophobic materials might eventually lead to industrial applications. Some attempts at fabricating a superhydrophobic surface include mimicking a lotus leaf surface, namely the two-tiered characteristic. This requires micro-scale surfaces with typically nanoscale features on top of them. For example, a simple routine of coating cotton fabric with silica or titania particles by sol-gel technique has been reported, which protects the fabric from UV light and makes it superhydrophobic. Similarly, silica nanoparticles can be deposited on top of already hydrophobic carbon fabric. The carbon fabric by itself is identified as inherently hydrophobic, but not distinguished as superhydrophobic since its contact angle is not higher than 150°. With the adhesion of silica nanoparticles, contact angles as high as 162° are achieved. Using silica nano-particles is also of interest to develop transparent hydrophobic materials for car windshields and self-cleaning windows. By coating an already transparent surface with nano-silica with about 1 wt%, droplet contact angles can be raised up to 168° with a 12° sliding angle. An efficient routine has been reported for making polyethylene superhydrophobic and thus self-cleaning—99% of dirt deposited on such a surface is easily washed away. Patterned superhydrophobic surfaces also have the promises for the lab-on-a-chip, microfluidic devices and can drastically improve the surface based bioanalysis. In the textile industry, superhydrophobicity refers to static roll-off angles of water of 20° or less. An example of superhydrophobic effect in live application is the team Alinghi in America's Cup using specially treated sailing jackets. The treatment is built up by micrometre size particles in combination with traditional fluorine chemistry. A recent application of hydrophobic structures and materials is in the development of micro fuel cell chips. Reactions within the fuel cell produce waste gas CO2 which can be vented out through these hydrophobic membranes. The membrane consists of many microcavities which allow the gas to escape, while its hydrophobicity characteristic prevents the liquid fuel from leaking through. More fuel flows in to replace the volume previously kept by the waste gas, and the reaction is allowed to continue. A well-known application of ultrahydrophobic surfaces is on heat exchangers, where they can improve droplet shedding and even cause jumping-droplet condensation, with potential for powerplants, heating and air conditioning, and desalination. Rare earth oxides, which are found to exhibit intrinsically hydrophobic surfaces, offer an alternative to surface coatings, allowing the development of thermally stable hydrophobic surfaces for heat exchangers operating at high temperature . Ultrahydrophobic desalination membranes for membrane distillation have also been fabricated for improved fouling resistance, which can be fabricated effectively with Chemical Vapor Deposition. It has been also suggested that the superhydrophobic surfaces can also repel ice or prevent ice accumulation leading to the phenomenon of icephobicity. However, not every superhydrophobic surface is icephobic  and the approach is still under development  In particular, the frost formation over the entire surface is inevitable as a result of undesired inter-droplet freezing wave propagation initiated by the sample edges. Moreover, the frost formation directly results in an increased frost adhesion, posing severe challenges for the subsequent defrosting process. By creating hierarchical surface, the interdroplet freezing wave propagation can be suppressed whereas the ice/frost removal can be promoted. The enhanced performances are mainly owing to the activation of the microscale edge effect in the hierarchical surface, which increases the energy barrier for ice bridging as well as engendering the liquid lubrication during the deicing/defrosting process. The ability of packaging to fully empty a viscous liquid is somewhat dependent on the surface energy of the inner walls of the container. The use of superhydrophobic surfaces is useful but can be further improved by using new lubricant-impregnated surfaces. ^ Wang, Shutao; Jiang, L. (2007). "Definition of superhydrophobic states". Advanced Materials. 19 (21): 3423–3424. doi:10.1002/adma.200700934. ^ Richard, Denis; Clanet, Christophe; Quéré, David (2002). "Surface phenomena: Contact time of a bouncing drop". Nature. 417 (6891): 811. Bibcode:2002Natur.417..811R. doi:10.1038/417811a. PMID 12075341. ^ Bird, J. C.; Dhiman, R; Kwon, H. M.; Varanasi, K. K. (2013). "Reducing the contact time of a bouncing drop". Nature. 503 (7476): 385–8. Bibcode:2013Natur.503..385B. doi:10.1038/nature12740. PMID 24256803. ^ Liu, Yahua; Moevius, Lisa; Xu, Xinpeng; Qian, Tiezheng; Yeomans, Julia M.; Wang, Zuankai (2014). "Pancake bouncing o superhydrophobic surfaces". Nature Physics. 10 (7): 515. arXiv:1406.3203. Bibcode:2014NatPh..10..515L. doi:10.1038/nphys2980. PMID 28553363. ^ de Gennes, Pierre-Gilles (2004). Capillarity and Wetting Phenomena. ISBN 978-0-387-00592-8. ^ Cassie, ABD; Baxter, S. (1944). "Wettability of Porous Surfaces". Trans. Faraday Soc. 40: 546–551. doi:10.1039/tf9444000546. ^ Extrand, C (2005). "Criteria for Ultralyophobic Surfaces". Langmuir. 68 (12): 2495–2532. doi:10.1021/la036481s. ^ Johnson, RE; Dettre, Robert H. (1964). "Contact Angle Hysteresis". J. Phys. Chem. 68 (7): 1744–1750. doi:10.1021/j100789a012. ^ Extrand, C (2002). "Model for contact angles and hysteresis on rough and ultraphobic surfaces". Langmuir. 18 (21): 7991–7999. doi:10.1021/la025769z. ^ Michael, Nosonovsky; Bhushan, Bharat (2007). "Hierarchical roughness makes superhydrophobic states stable". Microelectronic Engineering. 84 (3): 382–386. doi:10.1016/j.mee.2006.10.054. ^ Wang, S.T. ; Liu, Huan; Jiang, Lei (2006). Recent process on bio-inspired surface with special wettability. Annual Review of Nano Research. 1. pp. 573–628. doi:10.1142/9789812772374_0013. ISBN 978-981-277-237-4. ^ Ward, J.V. (1992). Aquatic Insect Ecology: 1. Biology and habitat. New York: Wiley & Sons. pp. 74, 96, 172, 180. ISBN 978-0-471-55007-5. ^ J. Brown. "US Patent 8,785,556". ^ Lai, S.C.S. "Mimicking nature: Physical basis and artificial synthesis of the Lotus effect" (PDF). Archived from the original (PDF) on 2007-09-30. ^ Koch, K.; Bhushan, B.; Barthlott, W. (2008). "Diversity of structure, Morphology and Wetting of Plant Surfaces. Soft matter". Soft Matter. 4 (10): 1943. Bibcode:2008SMat....4.1943K. doi:10.1039/b804854a. ^ Onda, T.; Shibuichi, S.; Satoh, N.; Tsujii, K. (1996). "Super-Water-Repellent Fractal Surfaces". Langmuir. 12 (9): 2125–2127. doi:10.1021/la950418o. ^ a b Miwa, M; Nakajima, Akira; Fujishima, Akira; Hashimoto, Kazuhito; Watanabe, Toshiya (2000). "Effects of the Surface Roughness on Sliding Angles of Water Droplets on Superhydrophobic Surfaces" (PDF). Langmuir. 16 (13): 5754–60. doi:10.1021/la991660o. ^ Shirtcliffe, NJ; McHale, G.; Newton, M. I.; Perry, C. C. (2003). "Intrinsically superhydrophobic organosilica sol-gel foams". Langmuir. 19 (14): 5626–5631. doi:10.1021/la034204f. ^ Teare, DOH; Spanos, C. G.; Ridley, P.; Kinmond, E. J.; Roucoules, V.; Badyal, J. P. S.; Brewer, S. A.; Coulson, S.; Willis, C. (2002). "Pulsed plasma deposition of super-hydrophobic nanospheres". Chemistry of Materials. 14 (11): 4566–4571. doi:10.1021/cm011600f. ^ Bico, J; Marzolin, C; Quéré, D (1999). "Pearl drops". Europhysics Letters. 47 (6): 743–744. Bibcode:1999EL.....47..743B. doi:10.1209/epl/i1999-00453-y. ^ Youngblood, Jeffrey P.; Sottos, Nancy R. (2011). "Bioinspired Materials for Self-Cleaning and Self-Healing". MRS Bulletin. 33 (8): 732–741. doi:10.1557/mrs2008.158. ^ Gao, LC; McCarthy, TJ (2007). "How Wenzel and Cassie Were Wrong". Langmuir. 23 (7): 3762–3765. doi:10.1021/la062634a. PMID 17315893. ^ Chen, W; Fadeev, Alexander Y.; Hsieh, Meng Che; Öner, Didem; Youngblood, Jeffrey; McCarthy, Thomas J. (1999). "Ultrahydrophobic and ultralyophobic surfaces: Some comments and examples". Langmuir. 15 (10): 3395–3399. doi:10.1021/la990074s. ^ Cannon, Andrew H; King, William P (28 May 2010). "Visualizing contact line phenomena on microstructured superhydrophobic surfaces". Journal of Vacuum Science and Technology. 28 (3): L21. Bibcode:2010JVSTB..28L..21C. doi:10.1116/1.3432124. ^ Fang, Guoping; Li, Wen; Wang, Xiufeng; Qiao, Guanjun (2008). "Droplet motion on designed microtextured superhydrophobic surfaces with tunable wettability". Langmuir. 24 (20): 11651–11660. doi:10.1021/la802033q. ^ Choi, Wonjae; Tuteja, Anish; Chhatre, Shreerang; Mabry, Joseph M.; Cohen, Robert E.; McKinley, Gareth H. (2009). "Fabrics with Tunable Oleophobicity". Advanced Materials. 21 (21): 2190–2195. doi:10.1002/adma.200802502. ^ Lim, Ho Sun; Kwak, Donghoon; Lee, Dong Yun; Lee, Seung Goo; Cho, Kilwon (2007). "UV-Driven Reversible Switching of a Roselike Vanadium Oxide Film between Superhydrophobicity and Superhydrophilicity". Journal of the American Chemical Society. 129 (14): 4128–9. doi:10.1021/ja0692579. PMID 17358065. ^ Zhao, Ning; Xu, Jian; Xie, Qiongdan; Weng, Lihui; Guo, Xinglin; Zhang, Xiaoli; Shi, Lianghe (2005). "Fabrication of Biomimetic Superhydrophobic Coating with a Micro-Nano-Binary Structure". Macromolecular Rapid Communications. 26 (13): 1075–1080. doi:10.1002/marc.200500188. ^ Yao, Ke Xin; Zeng, Hua Chun (2008). "Fabrication and Surface Properties of Composite Films of SAM/Pt/ZnO/SiO2". Langmuir. 24 (24): 14234–14244. doi:10.1021/la802528y. ^ Vakarelski, Ivan U.; Patankar, Neelesh A.; Marston, Jeremy O.; Chan, Derek Y. C.; Thoroddsen, Sigurdur T. (2012). "Stabilization of Leidenfrost vapour layer by textured superhydrophobic surfaces". Nature. 489 (7415): 274–7. Bibcode:2012Natur.489..274V. doi:10.1038/nature11418. PMID 22972299. ^ Xue, Chao-Hua; Jia, Shun-Tian; Zhang, Jing; Tian, Li-Qiang; Chen, Hong-Zheng; Wang, Mang (2008). "Preparation of superhydrophobic surfaces on cotton textiles". Science and Technology of Advanced Materials. 9 (3): 035008. Bibcode:2008STAdM...9c5008X. doi:10.1088/1468-6996/9/3/035008. PMC 5099662. PMID 27878005. ^ Xue, Chao-Hua; Jia, Shun-Tian; Chen, Hong-Zheng; Wang, Mang (2008). "Superhydrophobic cotton fabrics prepared by sol–gel coating of TiO2 and surface hydrophobization". Science and Technology of Advanced Materials. 9 (3): 035001. Bibcode:2008STAdM...9c5001X. doi:10.1088/1468-6996/9/3/035001. PMC 5099655. PMID 27877998. ^ Hsieh, Chien-Te; Wu, Fang-Lin; Yang, Shu-Ying (2008). "Superhydrophobicity from composite nano/microstructures: Carbon fabrics coated with silica nanoparticles". Surface & Coatings Technology. 202 (24): 6103–6108. doi:10.1016/j.surfcoat.2008.07.006. ^ Su, Changhong; Li, Jun; Geng, Hongbin; Wang, Qingjun; Chen, Qingmin (2006). "Fabrication of an optically transparent super-hydrophobic surface via embedding nano-silica". Applied Surface Science. 253 (5): 2633–2636. Bibcode:2006ApSS..253.2633S. doi:10.1016/j.apsusc.2006.05.038. ^ Yuan, Zhiqing; Chen, Hong; Zhang, Jide; Zhao, Dejian; Liu, Yuejun; Zhou, Xiaoyuan; Li, Song; Shi, Pu; et al. (2008). "Preparation and characterization of self-cleaning stable superhydrophobic linear low-density polyethylene". Science and Technology of Advanced Materials. 9 (4): 045007. Bibcode:2008STAdM...9d5007Y. doi:10.1088/1468-6996/9/4/045007. PMC 5099649. PMID 27878035. ^ Ressine, A.; Marko-Varga, G.; Laurell, T. (2007). Porous silicon protein microarray technology and ultra-/superhydrophobic states for improved bioanalytical readout. Biotechnology Annual Review. 13. pp. 149–200. doi:10.1016/S1387-2656(07)13007-6. ISBN 978-0-444-53032-5. PMID 17875477. ^ Hur, Janet I.; Meng, Dennis D.; Kim, Chang-Jin (2010). "Membranelss micro fuel cell chip enabled by self-pumping of fuel-oxidant mixture". 2010 IEEE 23rd International Conference on Micro Electro Mechanical Systems (MEMS). pp. 168–71. doi:10.1109/MEMSYS.2010.5442538. ISBN 978-1-4244-5761-8. ^ Miljkovic, Nenad; Enright, Ryan; Wang, Evelyn N. (2012-02-13). "Effect of Droplet Morphology on Growth Dynamics and Heat Transfer during Condensation on Superhydrophobic Nanostructured Surfaces". ACS Nano. 6 (2): 1776–1785. doi:10.1021/nn205052a. ISSN 1936-0851. PMID 22293016. ^ Warsinger, David E.M.; Swaminathan, Jaichander; Maswadeh, Laith A.; Lienhard V, John H. (2015). "Superhydrophobic condenser surfaces for air gap membrane distillation" (PDF). Journal of Membrane Science. 492: 578–587. doi:10.1016/j.memsci.2015.05.067. ISSN 0376-7388. ^ Rare-Earth Oxides Are Naturally Hydrophobic, Chemical Engineering News, 2013. ^ Warsinger, David M.; Servi, Amelia; Van Belleghem, Sarah; Gonzalez, Jocelyn; Swaminathan, Jaichander; Kharraz, Jehad; Chung, Hyung Won; Arafat, Hassan A.; Gleason, Karen K.; Lienhard V, John H. (2016). "Combining air recharging and membrane superhydrophobicity for fouling prevention in membrane distillation". Journal of Membrane Science. 505: 241–252. doi:10.1016/j.memsci.2016.01.018. ISSN 0376-7388. ^ Servi, Amelia T.; Guillen-Burrieza, Elena; Warsinger, David M.; Livernois, William; Notarangelo, Katie; Kharraz, Jehad; Lienhard V, John H.; Arafat, Hassan A.; Gleason, Karen K. (2017). "The effects of iCVD film thickness and conformality on the permeability and wetting of MD membranes". Journal of Membrane Science. 523: 470–479. doi:10.1016/j.memsci.2016.10.008. ISSN 0376-7388. ^ Nosonovsky, M. & Hejazi, V. (2012). "Why superhydrophobic surfaces are not always icephobic". ACS Nano. 6 (10): 8488–8913. doi:10.1021/nn302138r. PMID 23009385. ^ Chen, X; Ma, R; Zhou, H; Zhou, X; Che, L; Yao, S; Wang, Z (2013). "Activating the microscale edge effect in a hierarchical surface for frosting suppression and defrosting promotion". Scientific Reports. 3: 2515. Bibcode:2013NatSR...3E2515C. doi:10.1038/srep02515. PMC 3755279. PMID 23981909. ^ Smith, J D; Rajeev Dhiman; Sushant Anand; Ernesto Reza-Garduno; Robert E. Cohen; Gareth H. McKinley; Kripa K. Varanasi (2013). "Droplet mobility on lubricant-impregnated surfaces". Soft Matter. 19 (6): 1972–1980. Bibcode:2013SMat....9.1772S. doi:10.1039/c2sm27032c. Shirtcliffe, Neil (1 April 2008). "Superhydrophobic substances". Test Tube. Brady Haran for the University of Nottingham.